Day 1: Nairobi. Arrival and airport transfer . Afternoon city tour . overnight in Nairobi hotel. Day 2 :Crater lake Sanctuary: After breakfast ,briefing by the guide. 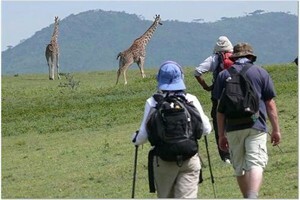 By 9.00 a.m. we leave Nairobi to head for Lake Naivasha, a fresh water lake in the Rift Valley at an altitude of 1890m. Its biggest attraction is the variety of bird life seen on it and its vicinity. A bird count of 400 species has been done in this area. We arrive at Crater Lake in time for lunch, where nature is at its best. We do a circular trek on the top of the crater from where we see the lake from various angles, with a close view of the many birds that are found here. We find our vehicle for a return journey to the hotel for dinner and overnightat Lake Naivasha Lodge. Day 5: We take a break from walking and visit by vehicle Lake Nakuru where thousands of pink flamingos shimmer over the water. As well as many other species of birds, there is big game including white rhino, buffalo, waterbuck, Grant's and Thompson gazelle, impala, jackal, lion and leopard. We have our lunch at the Lake Nakuru Lodge. In the afternoon there's a short transfer to the Lake Elementaita Lodge for overnight. Day 7: Lake Elementaita. Lake Elementaita may not be as well known as Lake Nakuru but its scenic beauty is unmatched. We walk up to the lakeshore from where we proceed to the hot springs and into the Kokopey Hills. We walk mainly in open savannah, occasionally stopping for a chat with a Masai herdsman. The gentle sloping hills give a good panorama. After, we return to the Lodge in time for lunch and a leisurely afternoon. Day 10: To Nairobi Carnivore Restaurant. After breakfast we head to Nairobi to arrive in time for lunch at the Carnivore Restaurant which is known for its barbecued game meat. Giraffe, zebra, gazelle, crocodile, ostrich are all delicacies. Free afternoon/shopping or transfer to the airport.